It was in November 2017 at the Climate Change Conference in Bonn, Germany when I first heard about the World Climate simulation. Amazed and convinced by the power of this tool recommended by the IPCC (Intergovernmental Panel on Climate Change) for climate awareness, I decided to run the World Climate simulation with a community of graduate students in Germany last February. 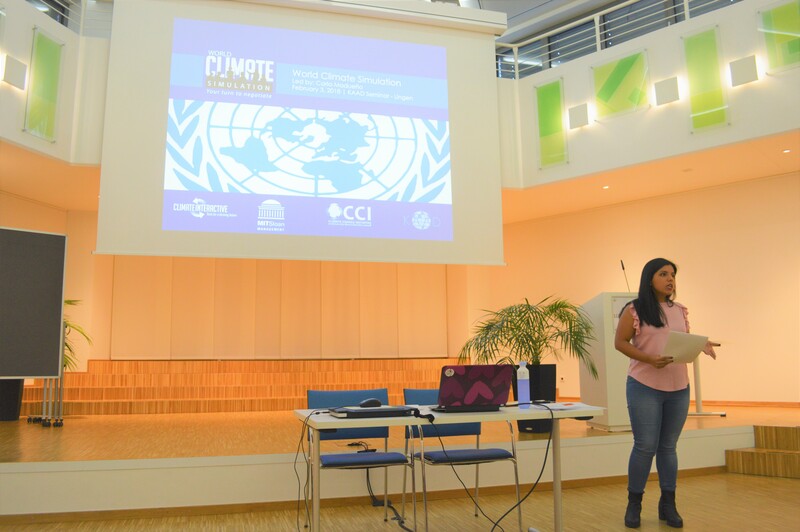 This article deals with the outcome of the workshop which was to raise climate awareness in participants in order to familiarize themselves with the Paris Agreement goals. What is the World Climate Simulation? Developed by the think tank Climate Interactive, in partnership with the MIT School of Management and the University of Massachusetts Lowell, the World Climate simulation is a role-play of UN climate negotiations. The model uses C-ROADS – a climate policy software – where agreed climate policies are entered and climate patterns get projected until the end of the century. Having had so far an astonishing success, this simulation has been carried out since 2008 over 800 times with over 38000 participants worldwide. When I first heard about World Climate, I was captured by the convincing arguments – such as the one above – shared during the Education Side Events at COP23 in Bonn. Motivated by the positive impacts this simulation has had and as a Global Change Ecology Master student, I decided to share with young future Latin American leaders this learning experience as well. With the support of the KAAD (Catholic Academic Exchange Service) and as part of the Latin American Seminar for scholarship holders held from 2nd-4th February 2018, the World Climate simulation was carried out with 32 participants from 13 different countries. 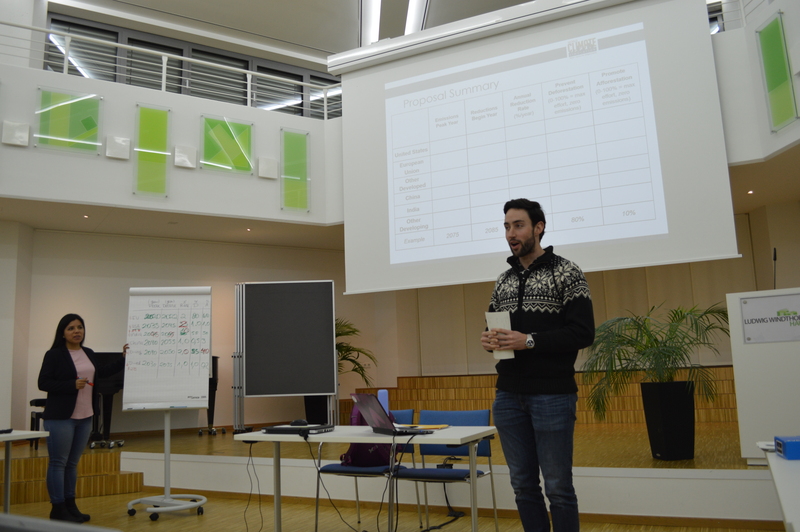 The weekend-long seminar offered cross-sectorial training for Latin Americans studying in Germany. 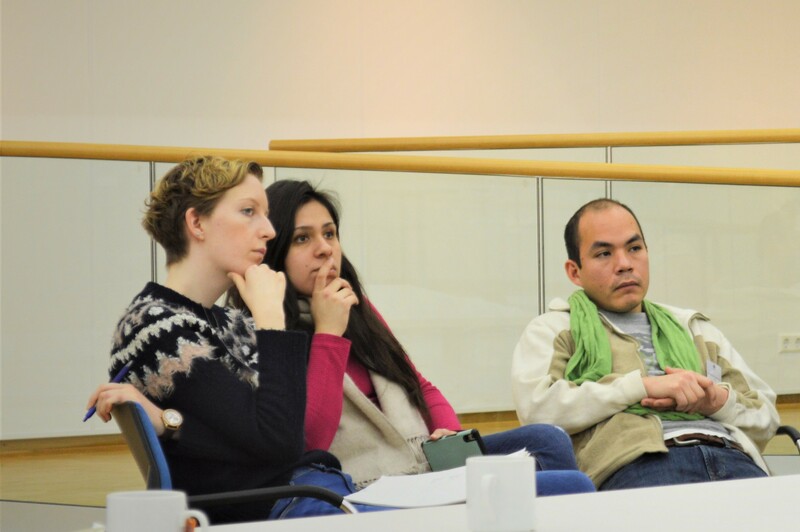 The seminar focused on the topic “El Buen Vivir” or “good living”, an alternative development concept that gathers South American indigenous wisdom to deliver sustainable answers to current social and environmental challenges. Within this framework, the World Climate simulation aimed to put participants in the spotlight and give them the responsibility to take political decisions that affect mankind’s and nature’s future with the goal of achieving the good common life. 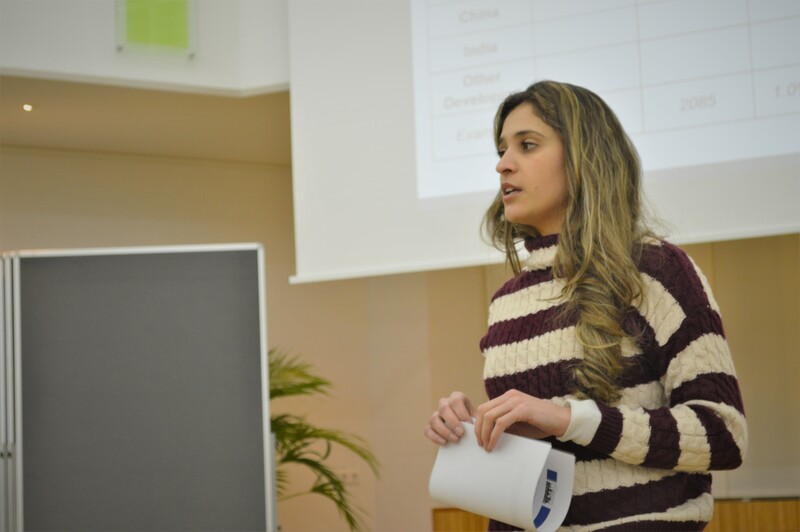 The 32 graduate students from 13 different nationalities were divided for the World Climate Simulation into 6 regional groups to represent China, India, European Union, USA, Other developed countries and Other developing countries. The simulation was carried out in the following way: As a facilitator I welcomed participants, introduced them to the C-ROADS model and World Climate simulation. I also made participants aware of the realistic (scientific facts and emotions) and unrealistic (simulated negotiation) elements of the simulation. The simulation started when I (as facilitator) adopted the role of Patricia Espinosa (UNFCCC) and participants adopted their respective roles as nation’s delegates. Overall, the workshop took about 2.5 hours. Key scientific facts about the Climate Change problematic were introduced first with a slide presentation and handouts to participants (materials available here). There were two negotiation rounds, each of 20 minutes, after which proposals by delegates were collected on a flipchart and then entered in the C-ROADS software. In the first round the negotiations led to a projected temperature by the year 2100 of about 3.1°C, after the second round, negotiations improved the climate outlook with a 2.9°C temperature increase, thus not meeting the expected Paris agreement goals. After the negotiations the role-play session concluded. Participants gathered in a circle to give their impressions of the session. A 2.9°C warmer world, can we do better? The impressions of the session focused on three key questions: (1) How did you feel during the simulation? Weak or powerful? (2) What were your most important learnings? (3) How do you think we could achieve the ambitious climate action? Participants highlighted the powerful impact the simulation has left on them, as they experienced directly the need for more ambitious political and civil society initiatives. Participants also brainstormed on solutions from their own professional backgrounds, starting with sustainable consumption, trade and markets, education for sustainability and legal and fiscal mechanisms so implement political action. As an individual aiming to spread the word for climate action outside the scientific circles, the opportunity to run the World Climate simulation with a very diverse audience was deeply motivating, empowering and touching. It was truly fantastic to see how, regardless of the professional background, participants would engage and discuss the urgent need to limit global warming by the end of the century in our small simulated world that day. Professionals from different fields such as international business, history, medicine, law and even philosophy would leave their “comfort zones” for two hours and experiment in the roles of politicians and advocates to decide for what is good for one or for all nations. Personally speaking, it was touching to see how the message of climate action can and must spread outside the barriers of natural science. I closed that day’s World Climate session by reminding the participants that having a more powerful role in society was in fact not needed, as our position as organized and aware citizens in society is in fact powerful enough. The World Climate simulation is a strong tool that beyond a climate action narrative, sends out a message of strength and empowerment, especially important for youth leaders from the global south. Within the framework of the good common life or “Buen vivir”, the lesson learnt as professionals, regardless of the role or position we may have, is that we shall never forget that life on this planet is our highest responsibility and main goal. That is what Climate Action stands for. Briefing statements could contain more concrete economic facts for region delegates to negotiate better. Sending reading material in advance may also help. Having “other developing countries” delegates sitting on the floor to metaphorically refer to unbalanced geopolitical relations may not be the best call. Ask in advance, as participants may take this personally. Alternatively find milder ways of representing power relations in the simulation. Adapt examples of climate change impacts to your audience background. I used Latin American cases, to engage Latin American audience with at-home ongoing issues. 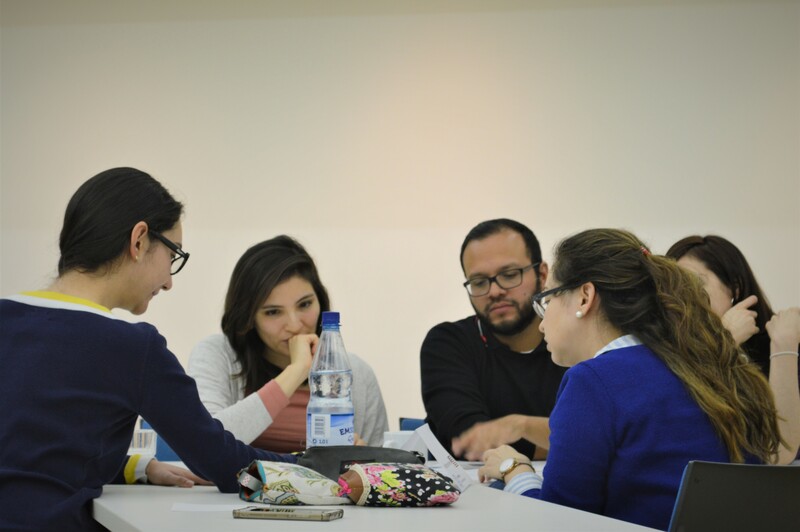 The World Climate simulation was possible thanks to the KAAD Catholic Exchange Service support and thanks to the facilitator advices provided by Eduardo Fracassi (ITBA Instituto Tecnologico de Buenos Aires, Argentina). First published on the Global Change Ecology.